Please refer to our stock # GG12-HO when inquiring. 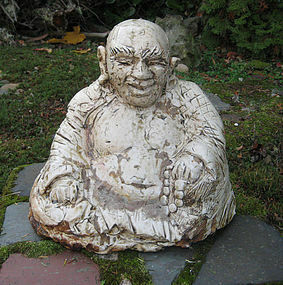 Hotei-san (Chinese=Budai) Ceramic Sculpture by George Gledhill; Payette, ID. H. 11.25"(28.5cm) x W. 12"(30.5cm.) Hotei-san is glazed in white and sculpted in sitting meditation pose, holding his prayer beads. Hotei is known as a God of Happiness and Contentment. In Japanese folklore, Hotei-san is one of the Seven Lucky Gods (Shichifukujin.) In China, legend has it that he was an eccentric Chan (Zen) monk who lived in the early 10th C. Some Buddhist traditions consider him an incarnation of the Maitrea (Future) Buddha. In Vietnam, he is known as Bo Dai. His name translates as "Cloth Bag," which he is usually seen carrying, along with Buddhist prayer beads. There have been several influences to George Gledhill’s ceramic work. Buddhism has been a guiding force in life for many years, and George even visits local prisons to teach the Dharma to inmates. Through pottery and Buddhism, he was exposed to Tea practitioners who complimented his work and encouraged him to produce Tea wares. Their introduction to the world of Tea Ceremony has helped to shape much of his recent work. In the past, George served in the Peace Corps in Bolivia, working with local potters and using only materials available locally. They dug all of the clay, made the bricks, built the kilns, and formulated glazes from whatever materials they could find. The only firing fuel was wood. This experience led to a great respect for the results of working with unprocessed materials, and especially for the magical qualities of wood firing a “primitive” kiln. Many of George's pots are fired in a noborigama (climbing kiln) built by George in 2012, on his farm in Payette, Idaho. The kiln has been named Shozangama (Pine Mountain Kiln. )They are created using mainly raw materials available in the Pacific Northwest. The whole process is marked by a great deal of physical labor, but this is the only way to get the results he desires.